rawtx - ln wallet | rawtx is a Bitcoin lightning network wallet app for Android. We removed the iOS version of the wallet from the app store due to low benefit/cost ratio. As some of you know, the latest version of the wallet had a problem with syncing. In that, it would first sync block headers, then sync filter headers. The problem is that these would be sequential and the progress bar would only reflect the block headers. So, many users were stuck at 99% while filter headers synced, leading to confusion. Based on feedback from our users, we’ve simplified the UI of the wallet. In addition to UI, we’ve also updated lnd to the latest 0.5 version. Currently available on Play Store or App store. Today, we are releasing the iOS version of the rawtx wallet, a mobile lightning network wallet for Bitcoin. Here’s a demo sending 20 satoshis from Android to iOS instantly over lightning network: https://www.youtube.com/watch?v=kftCcpKzlA0. Introducing rawtx, a mobile lightning network wallet! 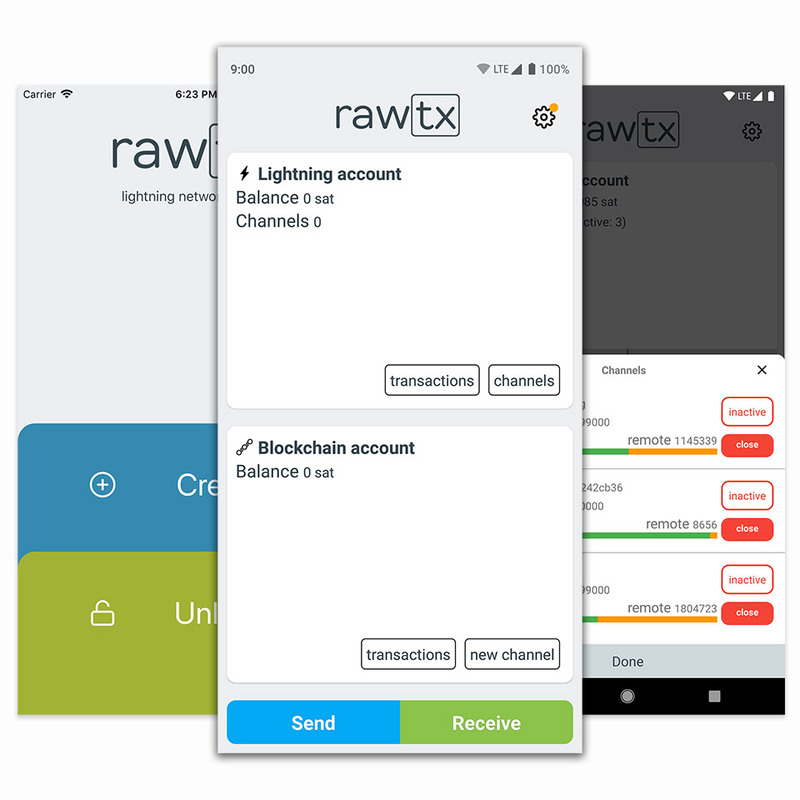 Today, we are releasing rawtx, a mobile lightning network wallet for Bitcoin. For now, it’s available on Android, with iOS version coming soon. rawtx is a Bitcoin lightning network wallet app for Android.